Restaurant manager required for established upmarket Restaurant in Bryanston. Candidates must be hardworking and have 4+ year restaurant management experience. Ability to manage & train staff a must. Strong customer relations skills very important. Must have front of house and general kitchen management experience. Will only consider well-spoken and well-groomed candidates. Applicants must be passionate about Restaurants. Candidates must be ambitious and hardworking. R 11000 - 13000 nett per month depending on experience. 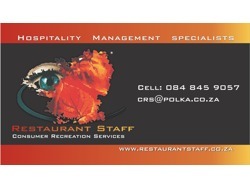 Contact 0848459057 / E-mail crs@polka.co.za Quote Reference RA45 when applying.